I love yogurt! It can taste good any time of the day. So when I saw this article I thought it was fun and that I would share it for my Healthy Wednesday Tip for the week. Here are 10 benefits that come from eating yogurt! 1. Yogurt can give you flat abs. Eat 18 ounces a day and you can drop a jeans size. People who ate that much -- in conjunction with cutting their total calories -- lost 22 percent more weight and 81 percent more belly fat than dieters who skipped the snack, according to research from the University of Tennessee, Knoxville. 2. Most brands of yogurt contain good-for-you bacteria. 3. Yogurt is loaded with vitamins. One serving is a significant source of potassium, phosphorous, riboflavin, iodine, zinc, and vitamin B5 (pantothenic acid). 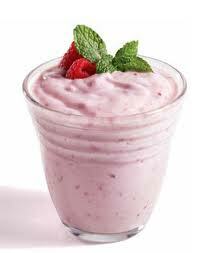 Yogurt also contains B12, which maintains red blood cells and helps keep your nervous system functioning properly. 4. A cup of yogurt a day can help you recover faster after a workout. With the right ratio of protein to carbohydrates, yogurt, particularly high-protein Greek yogurt, makes an excellent post-sweat-session snack. "The perfect time to grab a container is within 60 minutes of exercise," says Keri Gans, RD, a nutritionist in New York City. The protein provides the amino acids your muscles need to repair themselves, Gans explains, and the carbohydrates replace your muscles' energy stores, which are depleted after a hard workout. 5. Not all yogurt is equal when it comes to calcium and vitamin D.
Since it naturally contains calcium, you'd think the amount would be the same no matter which yogurt you pick. Wrong. "The levels can vary widely from brand to brand, so you really need to check the label. 6. Yogurt may prevent high blood pressure. Every day 70 percent of us consume more than twice the recommended amount of salt; over time that can lead to hypertension and kidney and heart disease. The potassium in yogurt, almost 600 milligrams per eight ounces, may help flush some of the excess sodium out of your body. 7. A daily serving of yogurt keeps colds away. Dig into four ounces each day and you may find yourself sniffle-free in the months ahead, according to a study at the University of Vienna. Women eating this amount had much stronger and more active T cells, which battle illness and infection, than they did before they started consuming it. 8. Yogurt can help your smile. Despite its sugar content, yogurt doesn't cause cavities. When scientists at Marmara University in Turkey tested low-fat, light, and fruit flavors, they found that none of them eroded tooth enamel, the main cause of decay. The lactic acid in yogurt appears to give your gums protection as well. 9. Raw doesn't mean better. Virtually all the yogurt in your grocery store has been pasteurized -- that is, exposed to high temperatures to kill any harmful pathogens. Raw-dairy fans claim that unpasteurized milk, yogurt, and cheese are better for you because they contain more health-boosting bacteria, but pasteurization doesn't destroy beneficial probiotics, Newgent explains. Plus, studies show that those who eat raw yogurt don't have stronger immune or digestive systems than people who stick to the pasteurized stuff. And raw-dairy products carry a risk of food poisoning. "E. coli and salmonella are two of the pathogens that can lurk in these foods and end up in your body," Newgent says. 10. Yogurt is a high-protein food. Yogurt can be an excellent source of protein, but "one variety may contain more than double the protein of another," Blatner says. . If you're eating it for the protein, look for brands that provide at least eight to 10 grams per serving.